This 1970s Seiko Wall Clock is in Stunning Condition when you consider its Age. The Glass is perfect. Its worth buying just to watch how the sweeping second hand reverts back to the 12 position when you reset the minutes. Warranties : all of our products carry a 12-month manufacturer’s warranty. This is in addition to your statutory rights and these are not affected in any way. requires 1x AA battery. 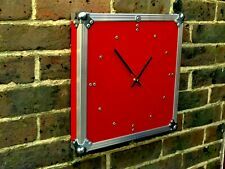 This is a flight case style clock in red laminate birch ply with aluminium edging and steel ball corners. Retro Kieninger Wooden Wall Clock. Size: 29cm X 29cm X 11.5cm. Could be an ideal Gift. Would go perfectly in any room in the house. 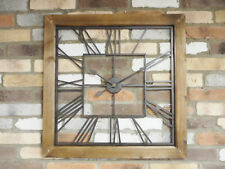 Great looking, Shabby, Retro style wall clock. Material: Ceramic. Could be an ideal Gift. Size: 24.5cm X 24.5cm X 4cm. This lightweight square tin clock has been upcycled using Tunnock’s Teacakes foil wrappers, giving it a retro feel. Finished with a satin sealer it would be a fun addition to a kitchen. Dimensions 25cm x 25cm. A Sleek And Very Stylish Item. Wall Hanging. A rich and luxurious square pendulum wall clock. Munterslaan, Netherlands. HABITAT SQUARE "GEO" CLOCK. IN MINT CONDITION, HAS BEEN IN A CUPBOARD FOR A YEAR - NEVER USED. I DON'T HAVE THE ORIGINAL BOX. CASH ON COLLECTION POSSIBLE FROM LONDON SE1. HWD 40cm x 40cm x 9cm. Gloss Black case. Retro Wall clock. Requires a AA battery (not supplied) for use. Retro Style Clock. Accessories shown in the pics are for display purposes only and not part of the sale. Requires batteries. 21-08-2018 17:21:21. It has a black face and beige numbers and is 317mm x 317mm. MADE ON TIN PLATE 0.5 MM. RETRO LOOK. EXTERIOR DECORATION: YES. EXTERNAL SIZE : 8.66 x 8.66" (22 x 22 cm). UV RESISTANT : YES. Vintage Seiko Clock, Quartz, Wall Hanging, Excellent condition, Fully working. Colour: Grey Distressed. Large Industrial factory style clock. Style: Factory Industrial. Depth: 9cm. Width: 70cm. Height: 70cm. A VINTAGE MIDWINTER STYLECRAFT RIVERSIDE PATTERNED PLATE WALL CLOCK. 22CM BY 22CM. IN GOOD CONDITION. The Large Hand Has A Tiny Kink. The Mier Space Station To Outer Mongolia - Estimate Only! Requires 1 AA Battery (NOT INCLUDED IN THE SALE). With a classy, minimalist look and simple yet classic design, The Karlsson Mini Flip Orange exudes panache and style, giving your room a superb, contemporary feel. Karlsson Mini Flip Orange Case Wall Clock. The range represents the most legendary cars ever made such as Aston Martin DB6, Jaguar E Type and Porsche 993 and many more. This impressive clock is individually handmade in a UK studio using carefully sourced authentic materials. 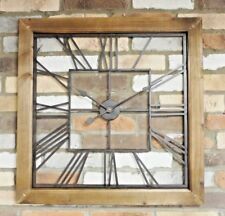 Beautiful Rustic large square Skeleton Clock With Rustic wood Surround. perfect for any wall. Retro 1970s Style Cube Mantle/Wall Clock. A rear hanging slot making it suitable for wall mounting or equally at. Handmade in England. Artist impression (ie. Size & Scale Guide. If you have any problems, no matter how small, we will do our very best to find a solution for you. Our promise. Diecast Models. We assure you that we will do everything we can to get your item to you as soon as possible. ). 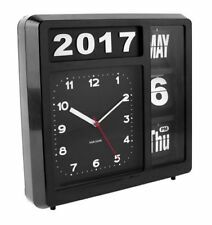 A square wall clock with a decorative moulded case and black finish. A flat glass lens completes the classic design. A decorative wall clock is the perfect way to create a focal point in a kitchen, bedroom or living room. A square skeleton style waxed wooden clock with black hands. 30cm x 30cm x 6cm. We aim to respond to all inquiries within 48 hours. Handmade in England. Artist impression (ie. Size & Scale Guide. Our promise. Diecast Models. We assure you that we will do everything we can to get your item to you as soon as possible. Handmade in England. ). Bordeaux Wine in antique design. Wall Clock. 35 x 3.5 x 38 - cm W x D x H. Requires 1x AA Bettery which is not included. Wooden Blue Pendulum style Clock.